Luxembourg is a real paradise for the hiker. Almost every village has a set of routes and the range of hiking-maps is wide.The official topographic maps of the Grand Duchy of Luxemburg in different scales are edited by the «administration du cadastre et de la topographie» (ACT): the map 1/100 000 with touristic infrastructures, 2 sheets (North and South) in the scale 1/50 000 and the 21 sheets in the scale 1/20 000 for the coverage of the country. Special touristic versions are edited in the scales 1/20 000 and 1/50 000. All maps are obtainable at Camprilux members, in bookstores or can be ordered at the «administration du cadastre et de la topographie». Real aficionados would perhaps prefer to stick to the national tracks, which are part of international routes, such as the GR5 or E2 (grande randonnée from the Netherlands to the Méditerranée) or the E3 (Atlantic-Bohemian Forest). The footpath known as E2 runs between the Oesling and the Eifel along the valleys of the Our, the Sûre and the Moselle, leading into France at Rumelange. The footpath E3 crosses onto Luxembourg soil at Martelange, and follows the Eifel-Ardennes footpath into Germany. Moreover, Camprilux campsites, which feature huts, also offer a luggage service from one to the next. Splendid bicycle tours can be made in the whole country, but do not forget Luxembourg is not a flat, levelled country and you will need some gear-equipment. Children under 10 are not allowed to use public streets on a bike and may we recommend you to be careful in traffic: Luxembourg's drivers are not used to many cyclists. A handy booklet with 40 cycling tours is available; the system is similar to the walking tracks: you can take out the pages individually and the routes are thoroughly. 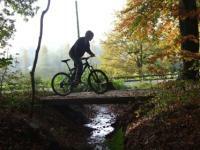 A mountain bike trip in the surroundings of Luxembourg is a great experience. The hilly and forest area offers everything a sports- and nature-man can imagine. For anyone who wants to explore his limits, the opportunity is given. The bikes should have good quality. There are maps of the surroundings on which a circuit is indicated and helmets and reparation material is offered. For the cycling circuits in Luxemburg, roads and cycle tracks, tour bikes for ladies and gents have to be considered. Circuits of many kilometres pass along beautiful places and sights. For children who can cycle there are children's bicycles and for the smallest children seats are available. Your bicycle can travel with you on the train, if there is enough space in the wagons, but not in the busses. Six green-fee golf-tracks in Luxembourg offer various possibilities to play as a guest. Reservations are recommended, as the unique setting of the tees makes them very popular. Most Camprilux campings offer a swimming pool or river bathing, allowing you to cool off on the spot. Different lakes allow water sports and canoeing can be practised on the river Sûre. Descending the Sure by Kayak is a wonderful thing to do in your spare time. Not only for trained people but also for clubs, schools, firm and everybody who would like to do something different. The kayaks are double or single kayaks or Canadian canoes. Special experience is not required. You will get all necessary instructions and information before the start of the tour. Children under 12 years of age are obliged to wear life-vests. These are also available for hire for adults who cannot swim also. The canoes are collected at the finish. Indoor pools are available in various towns for cooler days. Camprilux camp sites placed along a river have often rented the fishing rights. They can help you with the needed permit. A permit is also requested for fishing in the rivers along the border with Germany. Unfortunately, the amount of snow falling in Luxembourg is no given thing, so there is not much infrastructure for winter sports. Cross-country skiing is possible in the north of Luxembourg, but it is recommended to inquire in advance if the slopes are in use. Two Camprilux camp sites offer a naturist site: Camping Fuussekaul (www.fuussekaul.lu) in Heiderscheid and Camping Bleesbrück (www.camping-bleesbruck.lu) in Bleesbrück/Diekirch. The Luxembourg national tourist offices (www.visitluxembourg.com) have a brochure called “Sport and Leisure”, where you’ll find detailed information, addresses and rates.